An adorable addition to your November decor. 1. Gather your material. You will need white cardboard, scissors, white glue, black poster paint, white poster paint, a sponge paintbrush, tiny gray buttons, a piece of silver metallic ribbon, and a small piece of black foam. 2. 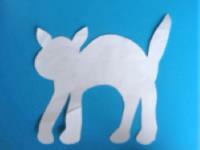 Draw a cat shape on the white cardboard and cut it out. 3. 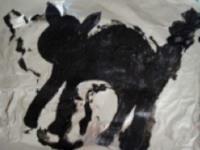 Using the sponge paintbrush, apply a generous coat of black poster paint all over the surface of your cat. 4. Before the black paint dries, add a coat of white poster paint on top using the sponge paintbrush to blend the colors together. 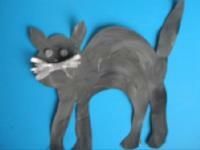 Children will enjoy seeing their black cat become a gray cat, like magic. Let dry. 5. 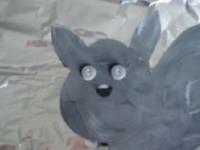 Glue two gray buttons on the cat's face to represent its eyes. Cut a small black nose out of the black foam and glue it under the cat's eyes. 6. 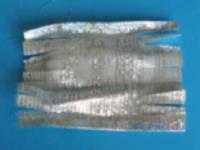 Cut several slits on either end of the metallic ribbon to create your cat's mustaches. 7. 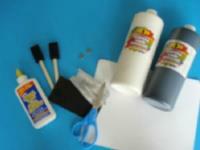 Shape the mustaches by gluing the top and the bottom of the ribbon together in the centre. Glue the cat's mustaches in place, under its nose. 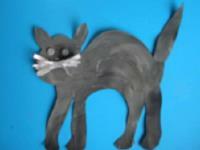 Let children play with their kitten or display the kittens on a wall.